It is pumpkin pie season! To be honest, we weren’t huge pumpkin pie fans until our son, Landen started loving them. He gave one a try a few years ago at Thanksgiving and has been hooked ever since. I always thought they would be hard to make and then I started trying different recipes and found out there are easy ways to make them. 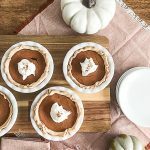 The last time I made this easy pumpkin pie recipe, I baked them in the mini pie plates I found at our local thrift store for my fall table! I couldn’t pass up these little pie plates when I saw them. They were brand new still in the package and I pictured them filled with mini pumpkin pies as soon as I saw them. This recipe makes 6 mini pies. If you want to make one regular sized pie, you will only need one pie crust. Crust: Take the pie crusts out of the box and roll them out flat. Place the mini pie plates upside down on the edge of the pie crust and use a butter knife to trace around the mini pie plates. I cut them out a little bigger than what that trace is so I have a little more crust coming up the sides. I could get two mini crusts cut from one crust and then I put the remaining scraps together to make enough for the last two pies. Put the crusts inside each pie plate and crimp the edges to make them look pretty (or leave them how they are for a more rustic look like some of mine turned out for this post). If you are using a regular size pie plate, you will just put one of the pie crusts in the pie plate. Filling: Mix the pumpkin, condensed milk, 2 eggs and pumpkin pie spice in a bowl until they are blended well. Ladle the filling into each pie crust. I fill the pies a little more than halfway. Bake: Put the mini pies on a baking sheet and bake them at 450° for 12 minutes. Then, turn the oven down to 350° for about 20-25 minutes more. The time will depend on your oven. Keep an eye on them. Since they are baked in a smaller pie plate, they bake faster. If you find your crusts are getting too dark, put foil over the crust. 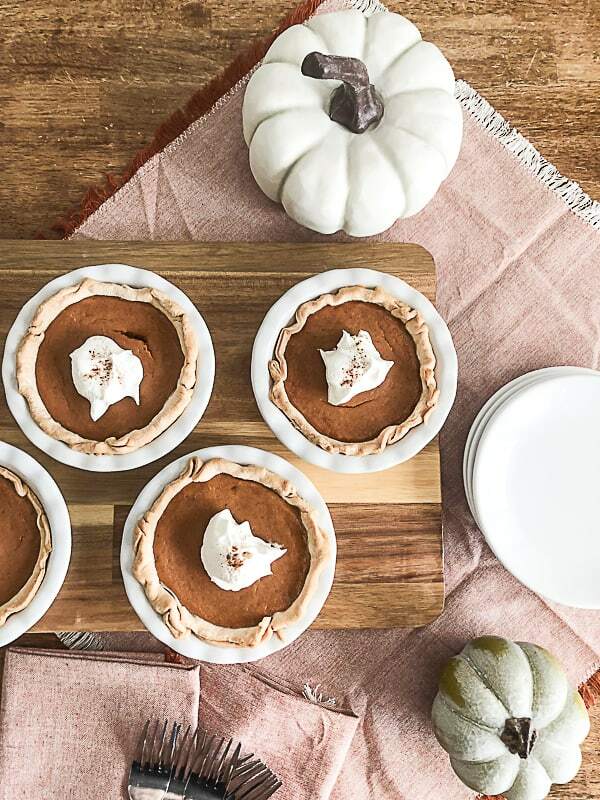 If you are baking a regular size pumpkin pie, the baking time will be more like 35 minutes at 350°. The pies are done when an inserted toothpick comes out clean. Crust: Take the pie crusts out of the box and roll them out flat. Place the mini pie plates upside down on the edge of the pie crust and use a butter knife to trace around the mini pie plates. I cut them out a little bigger than what that trace is so I have a little more crust coming up the sides. I could get two mini crusts cut from one crust and then I put the remaining scraps together to make enough for the last two pies. Put the crusts inside each pie plate and crimp the edges to make them look pretty (or leave them how they are for a more rustic look like some of mine turned out for this post). If you are using a regular size pie plate, you will just put one of the pie crusts in the pie plate. Filling: Mix the pumpkin, condensed milk, 2 eggs and pumpkin pie spice in a bowl until they are blended well. Ladle the filling into each pie crust. I fill the pies a little more than halfway. Bake: Put the mini pies on a baking sheet and bake them at 450° for 12 minutes. Then, turn the oven down to 350° for about 20-25 minutes more. The time will depend on your oven. Keep an eye on them. Since they are baked in a smaller pie plate, they bake faster. If you find your crusts are getting too dark, put foil over the crust. If you are baking a regular size pumpkin pie, the baking time will be more like 35 minutes at 350°. The pies are done when an inserted toothpick comes out clean. When you bring the pies out, they will be puffed up, but as they cool, they will go down. I let them sit for at least an hour. Then, we top them with whipped cream and some cinnamon. 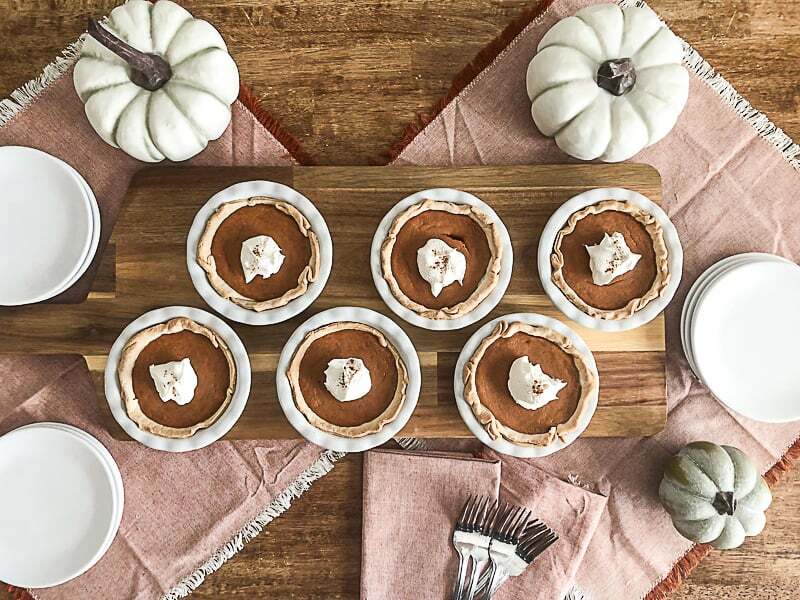 Does your family like pumpkin pie? If you have ever thought that making one is too hard, I am here to tell you it is not! 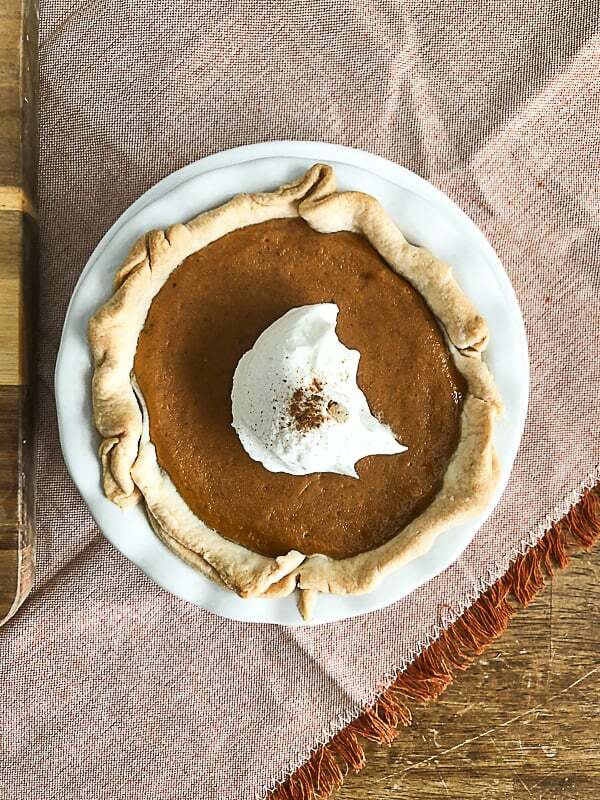 This easy pumpkin pie recipe will become your favorite dessert to make this fall. Your family and friends will love you for it because it is so good! What is your favorite fall food? Tell us in the comments below!